Hello friends, we are back from a delightful trip to Europe. Events with family and friends were at the center stage and I took a backseat with my photography this time. It was nice to take a break from social media and everything around. Sure, some pictures were taken but I wasn’t serious beyond creating some memory shots. On our final flight from Zürich / Switzerland back to Chicago the pilot had to take a different route than usual, due to a strike of French air traffic controllers. This gave us the chance to see the southern coast of Greenland. I have flown many times between Europe and America during the last 22 years but it was only the third time that I have seen Greenland from an aircraft. Most of the time the route runs further south. 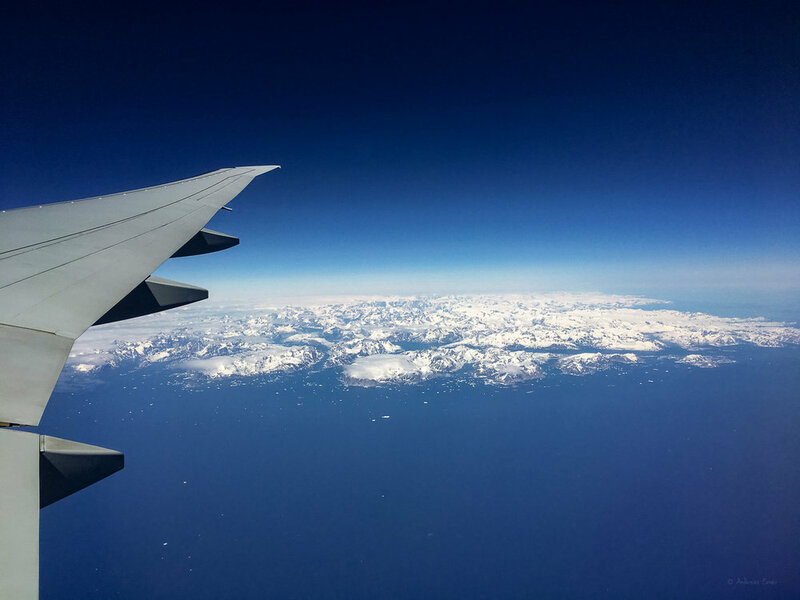 Luckily Joan and I had seats on the right side of the plane and we were able to enjoy this rare view with ice and snow covered mountains and ice floats in the water of the Greenland Sea in the North Atlantic Ocean.